Paul Cezanne (1839-1906) was a French artist and Post -Impressionist painter whose work laid foundations for a radically different art world of the 20th century through his usage of planes of color and building up complex fields. 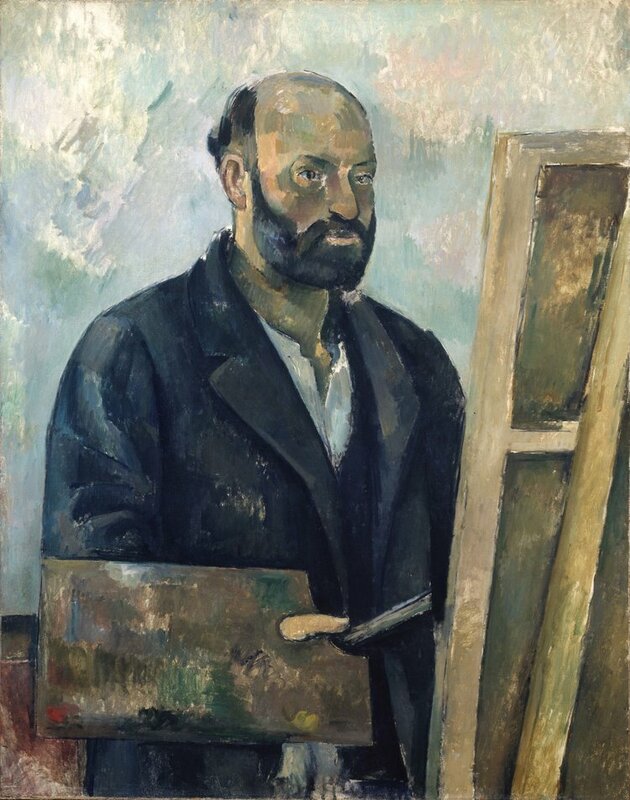 Although he studied art in Paris, along with law studies to please his father, Cezanne was never quite at ease with the lifestyle in Paris, nor was he confident about his own artistic skills. In the 1860s he decided to return home to Aix and pursue his craft in isolation. It was there and later in Pontoise that his paintings full of melancholy, fantasies and religious images hint at his potential. During his time in Pontoise, he started to work straight from nature, incorporating vibrant colors in his canvases, painting the nature but from his own, particular point of view. During the 1870s he found his own style that was different from other Impressionist artists, although Camille Pissarro was one of his biggest influences in terms of working outdoors and using a wider range of colors. What Cezanne’s paintings lacked, despite stylistically being Impressionistic, was the lack of sensuous feel in them. But his bold colors, repetitive brushstrokes, broken surfaces, planes and complex fields announced new tendencies in art. 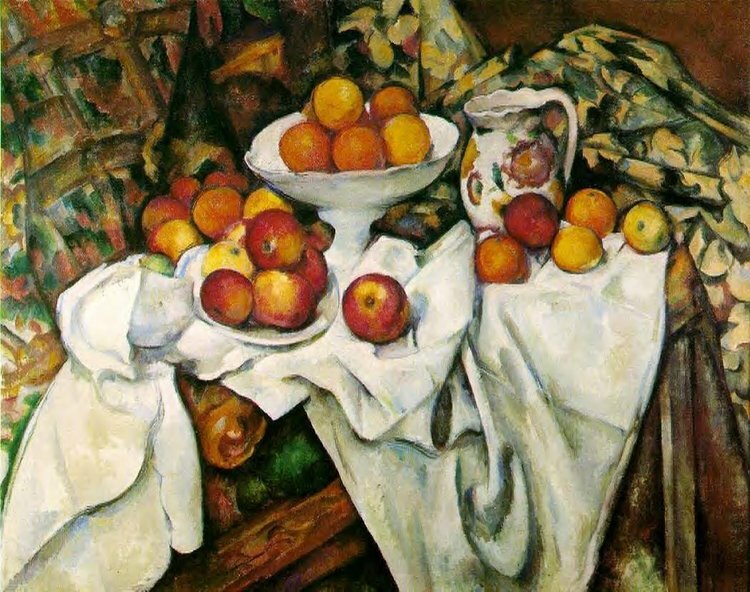 Cezanne was often called the father of modern art and an inspiration for cubism, as seen on the painting Still Life with Apples and Oranges he painted later in his career, where the link to cubism is evident in form of multiple viewpoints. Still life was Cezanne’s major theme that offered him freedom to paint the subject as he wished, with his conception of form. Though he painted still life compositions throughout his career, it was in later years that this genre began to occupy a central place in his work. It was through still life paintings that he could explore his own ways of establishing visual harmony and three-dimensionality. The Still Life with Apples and Oranges, that resides in the Musee d’Orsay, is one of six in a series the artist produced in his Parisian studio during the 1890s and many consider it to be one of the best still life compositions painted by Cezanne. Each one of those paintings featured the same earth ware dishes and a floral water jug, with similar arrangement, reminiscent of the 17th century Flemish still life paintings. 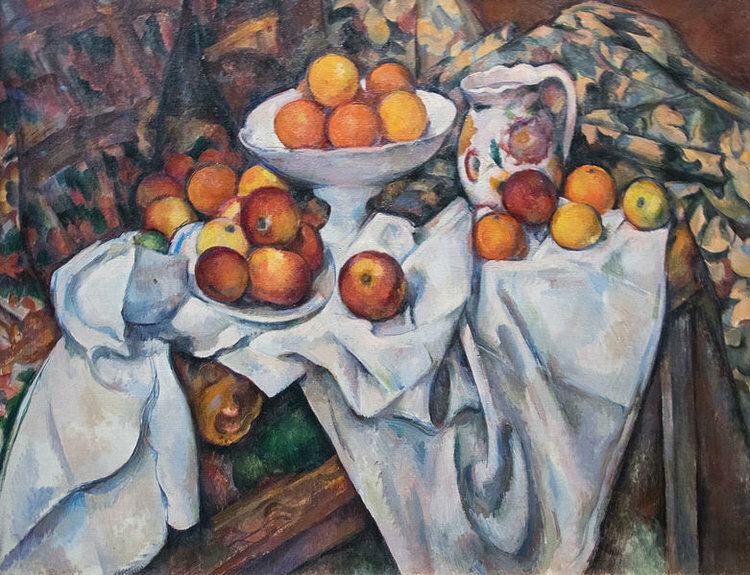 This particular lively and colorful image of a table full of apples and oranges is not a “true to nature” still life, a straight representation of a laid table. No one would pile dishes, fruit, a drape and a crumpled tablecloth on a table or chest in this way. A skillful disorder here is the result of a careful arrangement made by the artist to create a dynamic effect. The objects are disposed around the table in a seemingly casual fashion that gives an impression of movement, depth and life. The focal point of the painting is the apple at the front of the table. The apple is at the geometrical centre of the picture plane, where the two diagonals cross, but instead of a strict and formal arrangement, the setting is opposite. The old construction of rectangular framework of the table and the clear plane of the wall here does not exist. Instead, the space as a whole is broken and the difference between depth and surface, the vertical plane and the horizontal is veiled. Everything comes forward but there is a palpable depth. The entire canvas feels dense, crowded even and resembles Cezanne’s landscapes with woods and rock and his beloved Mount Sainte-Victoire. The Still Life with Apple and Oranges is an orchestrated work, masterful and complex and a delight of the senses. The white cloth is magnificent in its curving lines, it rises and falls. Against the whiteness and the subdued chords of the ornamented drapes – warmer and more angular in ornament on the left and cooler and more curved at the right – are the rich, pure colors of the fruit. Fruit are grouped simply in varying rhythms and form a stabilizer among many sloping shapes. The jug with red and yellow flowers serves as a bridge between the fruit and the drape. A sharply pointed form appears in many parts of the canvas, in the silhouette of the white cloth, the angles of the table, the edges of the canvas, in the drape at the upper left corner. The atmosphere of the painting is informal and almost disorderly, but the artist brought order into it without rigidity thanks to the markedly tilted plate of apples on the left, the leaning verticals, the harmony of color and form. “Painting from nature is not copying the object,” Cezanne wrote, “it is realizing one’s sensations.” With this painting he did just that.